The weekend is drawing near, which means it's just about time to kick back and relax with a bowl of your favorite strain. We'd like to introduce you to a few varieties recently added to the Leafly Explorer, and if you like the sound of any of these, check the links to see if any are available near you. 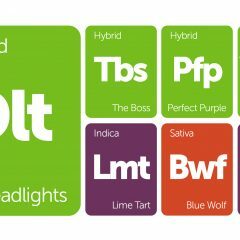 Remember, if you do have a chance to try one of these newly added strains, give 'em a review. Happy strain hunting! A cross between the legendary Jack Herer and DJ Short Blueberry, Blueberry Jack has something special to offer in both flavor and effect. Sweet, candied blueberry flavors invade on the inhale while the earthy, piney exhale reminds you of this strain’s Jack heritage. A lively sativa buzz typically dominates Blueberry Jack’s effect profile, with just enough physical relaxation to keep you grounded. Blueberry Jack offers an easy escape from stress and bad moods, keeping you positive and motivated through the day. 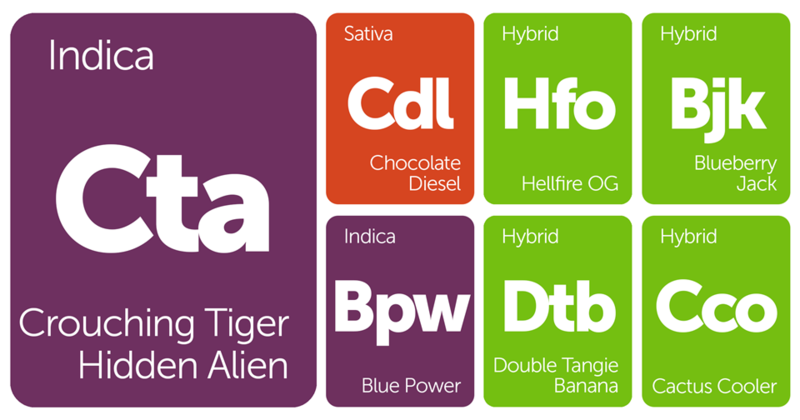 Crouching Tiger Hidden Alien is another indica staple from Exotic Genetix, who combined Tiger’s Milk with Starfighter to create this powerhouse strain. Flavors of pine and spice come through on the inhale while ushering in full-body tranquility. Its heavy-handed sedation makes Crouching Tiger Hidden Alien a perfect choice for sleepless nights or for getting rest and relaxation. Double Tangie Banana is a sativa-dominant hybrid strain developed by Crockett Family Farms. Supposedly a cross between Banana Sherbert and DNA Genetics’ orange-flavored Tangie, Double Tangie Banana oozes with crystal resin and citrus aromas. Anyone who has tried Tangie knows that this strain was primarily bred for the flavor enthusiasts, so if you’re searching for a strain with an impressive terpene profile, look no further. The indica-dominant Blue Power is one of Sin City Seeds’ signature strains, bred from Sour Double, Master Kush, The White, and Blue Moonshine genetics. Cherished for its fragrant buds, Blue Power offers a sweet fusion of lemon and berry flavors with an earthy finish. It should be noted that another genetic variation released by Vision Seeds crosses Blueberry, White Widow, and Skunk #1. This rendition is described as a happy and uplifting indica that helps focus the mind while fighting stress.